It comes up occasionally that someone will ask what the decan cards in Tabula Mundi’s expansion pack are, what they can be used for, and why they should get them. So I thought I’d post something here. First I’ll answer the what they are and why to get them, and then, some suggested ways to use them. As for the why part, as the artist I believe that the decan cards belong with the deck and make it complete. 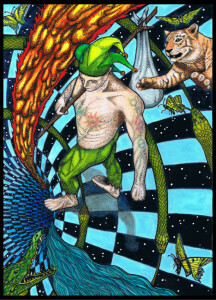 They are a unique creation that no other tarot artist to date has attempted. They are optional and you can elect not to get them, but at some point they will be gone. The box that the cards come in is deep enough to accommodate them, and they complete the set and fill that space. William Morris, the Pre-Raphaelite artist and textile designer, said that everything one keeps should be either useful or beautiful. It’s my opinion that these are both. Gemini, from Johfra’s Zodiac series. Sadly these posters are no longer being made, or I’d include a link. What they do is combine the designs from all three of the minor arcana cards that share an astrological sign into one image. They were intended to convey the symbols of the sign much like Johfra‘s Zodiac art, but by combining the three tarot cards that the astrological sign corresponds to. A little basics for those unfamiliar with astrology might help to understand the concept. The Zodiac is a complete circle and thus 360 degrees. 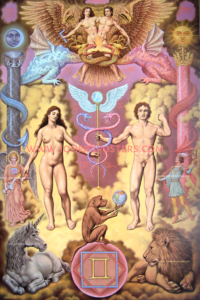 It is divided into the 12 signs that almost everyone is familiar with: Aries, Taurus, Gemini, Cancer, Leo, Virgo, Libra, Scorpio, Sagittarius, Capricorn, Aquarius, Pisces. Each of these signs is thus 30 degrees of the circle, or roughly 30 days. But the signs themselves are further divided by astrologers into ten astrological degree or roughly ten day segments, called decans. So there are 36 decans in the circle of the zodiac, three for each sign. Each decan of the sign has a planetary ruler, separate from the ruler of the sign itself. A lesser known thing is that the minor cards 2 thru 10 of the tarot, each correspond to one decan. For example, the 2, 3, and 4 of Wands correspond to the sign of Aries. 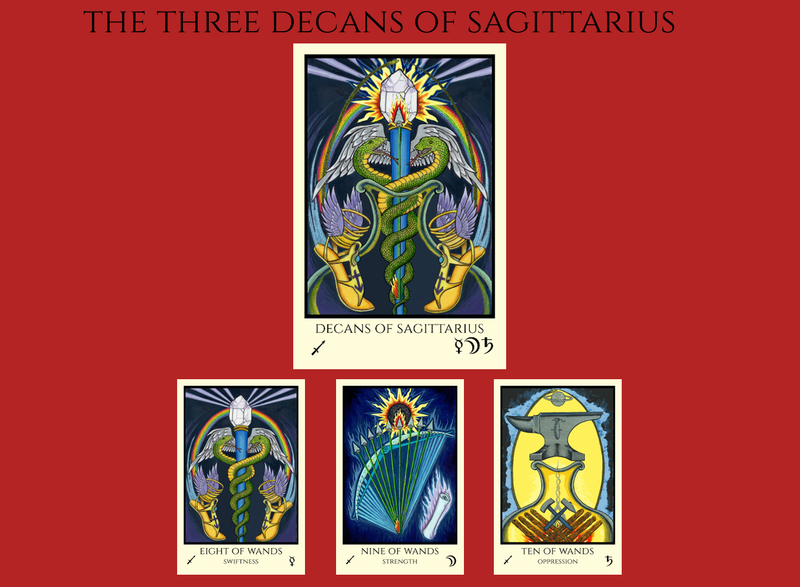 The 2 of Wands is the first decan of Aries, the 3 is the middle decan of Aries, and the 4 is the last decan of Aries. Aries season runs from approximately March 20th through April 20th. So if you were born in the first ten days of that period, your Sun sign is likely at a degree between 0 Aries and 9 degrees 59 seconds of Aries, or the first 10 degrees of Aries, and thus your personal minor card is the Two of Wands. If your Sun sign is between 10 and 19 degrees 59 seconds of Aries, or roughly the second ten day segment of the period, then your personal minor is the Three of Wands. Or if you were born in the last ten days or so of the sign and your Sun is from 20 degrees to 30 of Aries, then your card is the Four of Wands. Aries itself is ruled by Mars, but each of these decans, or minor cards, also has a decan ruler. 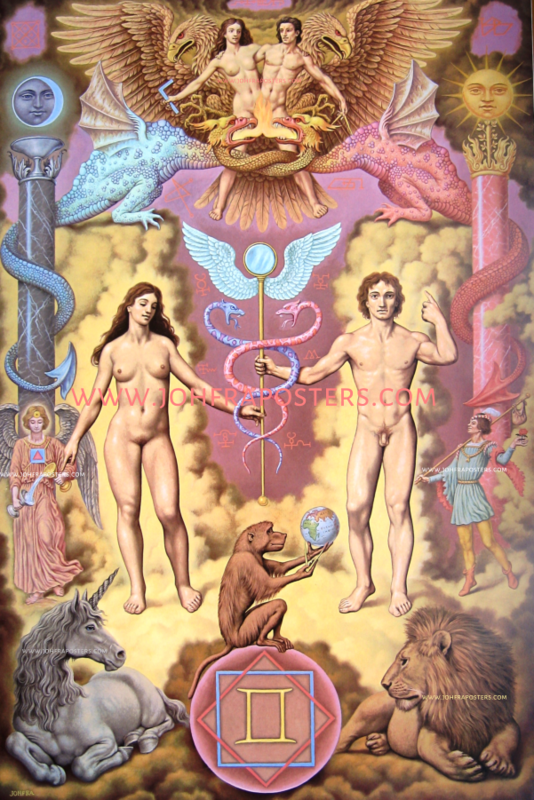 The Two is also ruled by Mars, the Three is ruled by the Sun, and the Four is ruled by Venus. So now that you know what they are, and how they were created, you may be wondering how to use them. Many of you will grasp this intuitively, and some of you may use them in other ways than the ones I mention here. But here are a few ideas. Many tarot spreads suggest choosing a significator card for the querent. This makes it clear who the querent is and gives a focal point to the spread around which all the other cards revolve. Sometimes one of the court cards is chosen, less often it is a minor or major. Usually it is either based on the person’s Sun sign, appearance, or personality. But many readers dislike assigning a card as a significator, and thus removing it from the deck and taking it out of play so it then cannot come up in the reading. One use for these decan cards is as the significator for the querent being read for. Most people know their own Sun sign, even if they are not familiar with anything else astrological. Without being familiar with their chart degrees, you can’t be sure which minor card they are if they are close to the edge of a decan. Anyway many people would find it cumbersome to memorize the dates, and no one likes taking a card out of play. 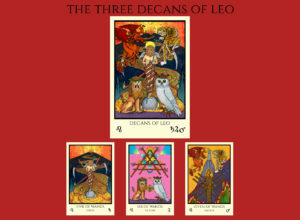 With these, if the querent is an Aries, the “Decans of Aries” card can be used. But a significator card does not have to be limited to the Sun sign of the querent. It can also be used to signify the question itself. For example, if the question is about getting ahead at work, the Capricorn card would be a good choice. If the question is about romantic partnership, the Libra card might be chosen, and so on. So, what if you just don’t use significators at all? These cards are not limited to that! There are some other uses to consider. Practical magick layouts as in Donald Tyson’s book, Portable Magic: Tarot is the Only Tool You Need. One is simply for study and meditation. Taking the decan card and laying out the related minors as shown in the images, plus the related Majors, and studying the related symbols, can yield new insights. 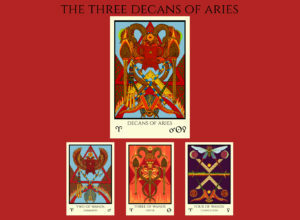 For Aries one would lay out the decan card with the Two, Three, and Four of Wands, and the Emperor card, to get insights about things Aries in nature. Another use is for timing. Although timing questions are tricky with tarot, some do draw from the separate stack of decan cards for questions of timing. Things like, “When would be a good time to do X?”. Since each card corresponds to a 30 day period of the year, they can serve that purpose. Some use them as a perpetual calendar. Since these cards each correspond to a sign and thus a season, many people will place the appropriate card on their altar, for example from March 20th thru April 20th, the decans of Aries card serves to remind you that it is Aries season, with all the themes that entails. Here in the Northern Hemisphere, it serves to remind one that Spring has arrived and the Earth is awakening, and the days are getting longer, and it is time to awaken from Winter’s sluggishness. This perpetual calendar idea can be as simple as displaying the one card during the season. 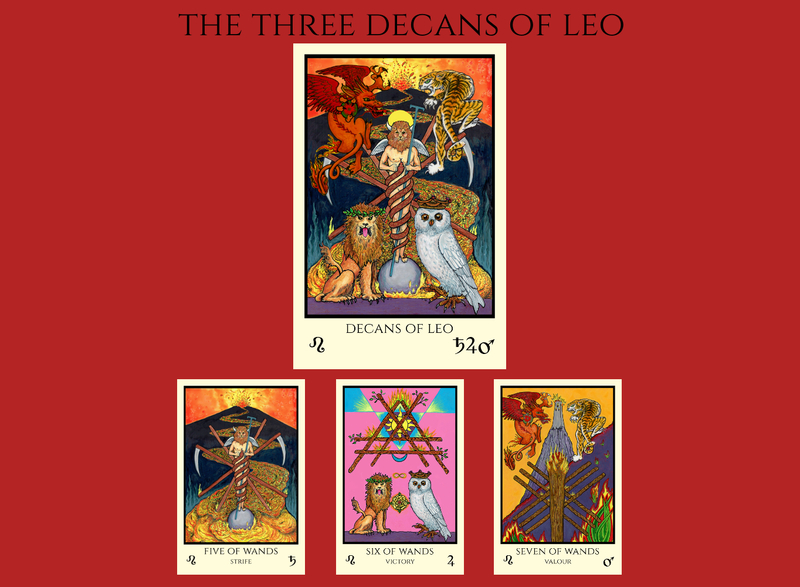 But some also will include the other cards as well, so having the decan card of Aries displayed with the Emperor card for the season, and swapping out the minor cards every ten days as the decans change. And some take it further, by adding the Major for the planetary ruler of the decan. So for Aries season, the Aries decan card and Emperor card would be displayed for the whole month, being joined by the Tower for Mars in the first ten days, the Sun for the Sun for the second ten days, and the Empress for Venus in the last ten days. And some take it even further, making note of the moon phase and adding study material to their calendar. A magnetic board is great for this purpose. For an excellent example of someone doing this using the Tabula Mundi decan cards, there is a thread on the Cartomancy forum by a dedicated practitioner, titled Nemia’s Tarot Calendar. Doing this as a practice really aligns one to the energy of both the cards and the seasons, and the sense of time as it passes. Too often nowadays we get busy and distracted by tasks and technology and forget to slow down and remember where we are in space and time. We forget what season it is and what the Sun and Moon are doing, and become disconnected. This keeping of a meditative calendar helps remind us to be present. There are lots of creative people in the world, probably using these in different ways. Let us know if you are one of them! POLL: Which Major Arcana card of my new deck do you MOST want to see? I promise not to ask “can we have a mini set of the zodiac expansion pack”. Oops, seems I did. Ah that reminds me of the other use: portable magick! I added it to the list. It’s cool if you use the Decanic cards as an outer ring, with the Majors on an inner ring. Somehow it all seems that much more powerful. Mind you, you have to use a bigger table. 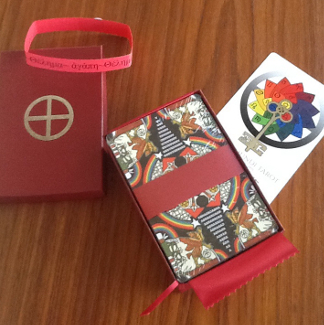 The decan cards also work well as place holders for the astrological house spread or zodiac sign spread. This helps with the retention of the natural zodiac and their essences for those that are learning. I.e. second and third operation of the OOTK. I’m more than honoured to see my tarot calendar mentioned! The Tabula Mundi decan cards were my inspiration for a calendar project that I started more than a year ago. It helped me get into the rhythm of the seaons, zodiac, decans and weekdays. I celebrate them with the tarot, deepening my understanding of the tarot, the world and my life at the same time. The Tabula Mundi and Rosetta Tarot are excellent reading decks and so much more – they open up the world of esoteric wisdom and cosmic harmony. Thanks Nemia! And thank you for putting up the post to inspire others. I love how keeping a calendar like that keeps one in touch with rhythms and seasons, as well as encoding the card associations.